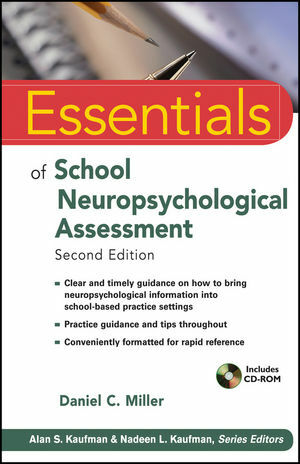 Written by a renowned expert in school neuropsychology, Essentials of School Neuropsychological Assessment, Second Edition is a practical resource presenting school psychologists, educational diagnosticians, and pediatric neuropsychologists with clear coverage and vital information on this evolving area of practice within school psychology. Filled with case studies and guidance for your practice, the Second Edition offers new coverage of major neuropsychological test batteries for children, including NEPSY ®-II; Wechsler Intelligence Scale for Children®, Fourth Edition Integrated; and Delis-Kaplan Executive Function System ™. Like all the volumes in the Essentials of Psychological Assessment series, this book is designed to help busy mental health professionals quickly acquire the knowledge and skills they need to make optimal use of major psychological assessment instruments. Each concise chapter features numerous callout boxes highlighting key concepts, bulleted points, and extensive illustrative material, as well as test questions that help you gauge and reinforce your grasp of the information covered. The accompanying CD-ROM provides helpful tools, including sample case studies and searchable databases of neuropsychological tests classified by processing area and conceptual model. Essentials of School Neuropsychological Assessment, Second Edition explores how to identify the need for testing, conduct a neurodevelopmental history, select appropriate assessment instruments, effectively evaluate students, and accurately interpret results. DANIEL C. MILLER, PhD, is a Professor and Chair of the Department of Psychology and Philosophy at Texas Women’s University. He has over 30 years of experience as a school psychologist practitioner and trainer and over 25 years of experience as a school neuropsychologist.